Fishing in the many trout management areas presents wonderful put-and-take opportunities through the end of May, and many of the more pristine waters all summer long. Catch-and-release areas offer the excitement of catching trout where there are greater numbers. Maps, and stocking schedules and updates can guide you to the best spots. The spring and early summer provide a lot of fun fishing at local lakes, ponds and streams where fish such as bluegill sunfish, crappie and largemouth bass are found. A simple bobber rig with a hook around a size 6 or 8, and some garden worms will do the trick. If you have access to a large boat, the Trophy Striped Bass Season offers the chance to catch a large rockfish. The fish are usually around until the third week of May. White perch will be moving into the tidal waters by the end of May, making for great fishing off docks and piers. The best way to fish is straight down near the dock pilings, since perch tend to look for food near structures. You can use pieces of bloodworms or grass shrimp on a size 6 or 8 hook with a little weight. 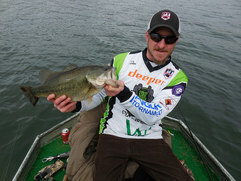 From July 26-29, some of the best bass anglers in the world will be headed to the upper Chesapeake Bay in Harford County to participate in the highly competitive Bassmaster Elite Series. This tournament will be packed full of action for the whole family, from a cool boat parade in Havre de Grace to rides and games, and official weigh-ins at Ripken Stadium. Staff will be there to help as well as answer any questions. It’s been an unusually chilly spring, but that doesn’t mean you should stay indoors. In fact, the fish are still biting, and what better way to get outside than to experience a Youth Fishing Rodeo! 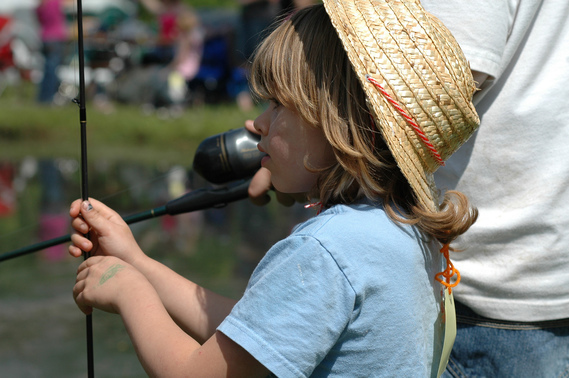 These events are designed for children, ages 3-15, to learn basic angling skills, develop stewardship ethic, provide a positive outdoor experience and encourage fishing as a family activity. Below is a list of upcoming rodeos to be held May 5. For a full list, take a look here. Don’t forget to register; rodeos fill-up fast! My First Fish recognizes an angler's achievement of catching their first catch. Fill out the certificate and print it on a color printer. You can also attach a photo to the top right corner. Any fish is eligible that is caught in state waters. All fish that do not comply with Maryland law or regulations must be immediately returned. Any angler is eligible regardless of age. Whether this is your very first time fishing or you're almost a pro, share your experience on the Youth Angler’s Log, a site dedicated and designed just for you. Submit your catch with a brief story of where, when and what you caught. The log allows you to tell your very own fish story!